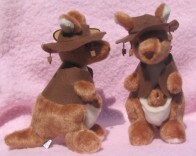 Kangaroo Gift Shop offers a collection of kangaroo themed gift items from Australia. 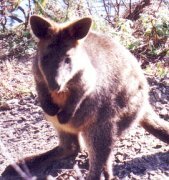 Did you know how kangaroo's got its name? When Europeans first saw kangaroos they asked a native Australian what they were called. He said 'Can-ga-roo' meaning 'I don't understand your question'. The explorers thought this was the animal's name. Large polyester filled kangaroo with joey toys. Kangaroo head can be turned around, so you could always direct it the right way. High quality Australian cast brass chain key ring. 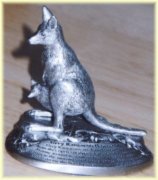 This detailed figurine (small statuette) of a Grey Kangaroo is made of Australian pewter in Tasmania. 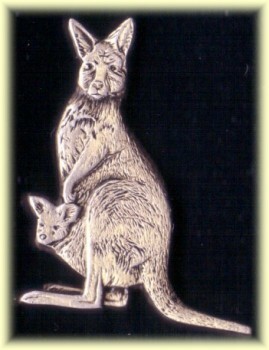 Brass lapel or hat kangaroo pin.